Following the realisation of the Frers 104', another imposing, technological sailing boat, the French boatyard CNB proposes this 115', designed by Philippe Briand and Andrew Winch. This is the biggest yacht in composite material ever realised at this yard in the transalpine country, which for the deck equipment has chosen modern, light materials like carbon for the mast and boom. The generous set of sails includes a spanker that can be rolled inside the boom and two bow sails, all relatively simple and easy to manage. The interiors have been designed by Andrew Winch, to meet the requirements of the owner, resulting in the owner's suite astern equipped with two king size beds, an office, two bathrooms with shower and, en suite, dressing room and plenty of available space. Amidships there is the spacious saloon, including a semicircular sofa with a round table, L-shaped sofas and here too, plenty of space. Another six cabins complete the interiors, together with five bathrooms, a galley and dining area. Outside, the cockpit is divided into two areas, a spacious living area and control station with double wheelhouse. 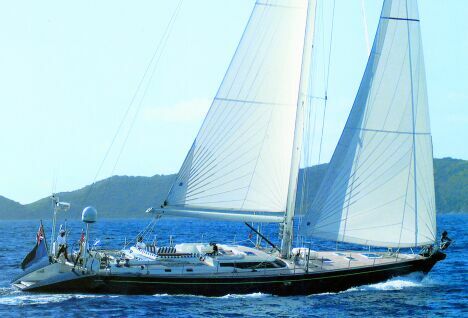 Overall this is a modern yacht, giving good performance thanks to her water lines that ensure entirely respectable sailing quality, comfortable thanks to her size and the clever interior design. For information please visit www.cnb.fr or write to cnb@cnb.fr.